One Small Clue, the father of the Poise drum sampler, has launched Grace, a new VST sampler for Windows. If you found SampleTank 3 too exhaustive and the Free version is not enough, IK Multimedia now has an intermediate SE edition. 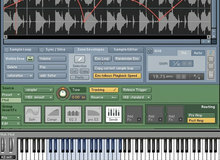 This week, IK Multimedia offers 5 new collections of instruments for the free version of SampleTank 3. Every Thursday for a few weeks now, UVI runs a flash sale on a product that lasts only until the next Monday. IK Multimedia offers this week no less than 6 instruments for the free SampleTank 3 version. Univers Labs, a British mobile app developer, offers a free looper that you can try online and download to your iPad. Those who can’t afford or don’t want all the SampleTank 3 sound collection, IK Multimedia released a free version. De la Mancha has been inviting you to donate to Cancer Research UK for several months, and he now wants to reach £1000.